Victory for NYSUT Backed Candidate! They said it couldn’t be done! Well, we did it! 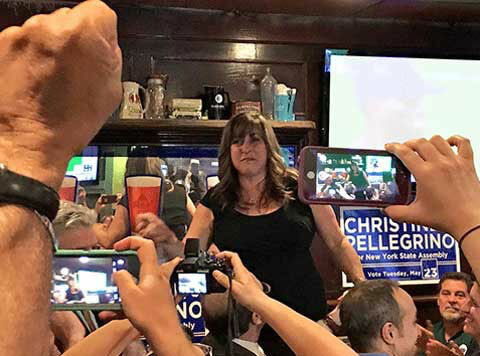 Thanks in large part to the dedicated activism of hundreds of NYSUT members and labor volunteers, Long Island teacher Christine Pellegrino won a huge upset victory this week in the special election in New York’s 9th Assembly District. The big win has become national news. In a note of thanks, Pellegrino said, “When we work together, when we organize, when we fight back, WE WIN!” You can go to the MAC to send a personal message of congratulations and to wish her well in the state Assembly! his year’s Spring Luncheon was held at the Long Island Museum in Stony Brook, with a bonus of complimentary museum entrance for all attendees. This unique lunch venue was arranged by Larry and Anne Ryan who are docents at the museum. R-UTN members were welcomed to the museum by Deirdre Doherty, Director of Development. Ms. Doherty gave a special thank-you to educators and donated two museum memberships to our raffle. Thanks to all members who donated items to a the raffle to raise money for our scholarships. A good time was had by all, and a gallery of the photographs can be found in the Photo Gallery of this website. Tuesday, May 16 is the date for School Budget and Board Elections in New York State. The students of your district are depending on you. Be a responsible citizen and VOTE! Saturday May 13 is “Fill a bag – feed a family” Post office collection day.